Coconut wraps are a great flexible ‘tortilla’ type product that are made from just coconut! A little pricey, at about $1/wrap, these are great for special occasions, or to change lunch or dinner up a bit. I love that they are shelf stable and don’t contain any weird ingredients. You can find them on Amazon or Thrive Market if you have an account on Thrive. I bought these wraps to help simplify eating on the road, and they are fantastic for that! I have one child who is not really a fan, but I think he was expecting a wheat tortilla taste, where these taste decidedly like coconut. In this wrap above, I used Spinach-Artichoke dip as the spread (recipe here). It contains mayonnaise, spinach, artichoke hearts, and I did add a bit of cheddar cheese too. It was delicious with sliced turkey meat! Applegate makes a few brands of high-quality lunch meat. Having the spinach dip already made, these wraps were a snap to whip up. From there, I rolled them in waxed paper firmly and cut in half for easy eating. I will be purchasing these wraps again in the future for sure. We don’t often eat on the road, but some times it is necessary, these are a great crumb-free alternative to grain-free breads. The price will keep these limited to special occasions at my house. This is a specialty product made of high-quality ingredients, I do think that for what they are the price is reasonable, though. And they still are going to be loads cheaper than stopping to go out to eat. They taste like coconut! See below for what goes well with coconut, and plan your fillings accordingly. If they become cold, they do break into pieces. Since room temperature can be different in different houses, you may have trouble with them breaking. I had to let them warm up a bit on a cutting board (off the cool granite!) before they could roll easily. What goes well with coconut? Since these wraps are made out of coconut, you will want to plan fillings that complement the flavor, rather than clash with it. Some fillings from dinner leftovers that would be delicious in these wraps: Brazilian Chicken with Coconut Sauce, Egg Salad with Basil, Ginger Beef Stir Fry, Lemon-Pepper Chicken with Avocado Mayo. You can purchase Organic Coconut Wraps here. Sounds good! Just curious have you tried the Siete family foods? There’s several types of tortillas as well as “tortilla chips.” I’m curious to hear your take on them. 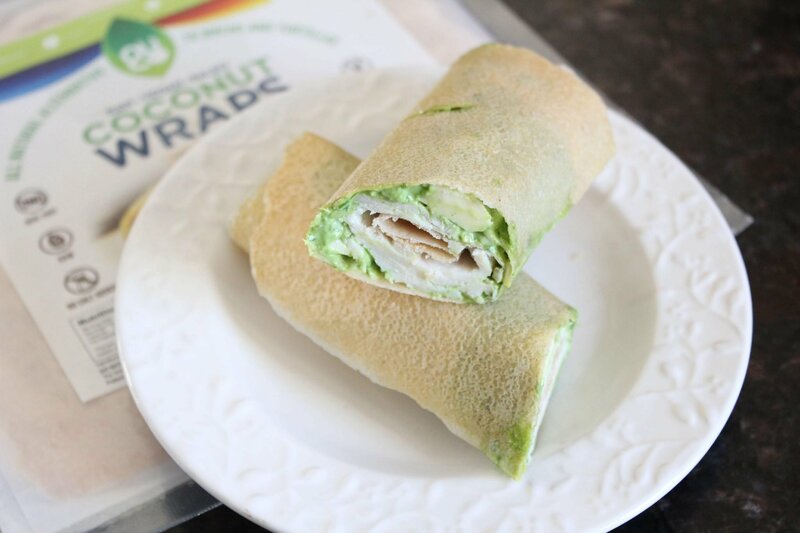 What is the sodium and sugar content of the coconut wraps? I am off all grains and these look interesting.